A Triceratops is a type of dinosaur which has three horns on its head and at Odette Sculpture Park in the City of Windsor, Ontario in Canada, a massive sculpture of this dinosaur is on display. Dating back to the late Cretaceous period, approximately 65 million years ago, this sculpture is a conversation piece for tourists to the park where he nibbles on the ground in his fenced enclosure. The Triceratops and the Apatosaurus are two of the newer sculptures placed in the Odette Sculpture Park and have become a huge success taking people back 150 million years. Located along the shores of the Detroit River, the park is maintained by the city's Parks and Recreation Department where at least 31 contemporary sculptures are on display created by world-renowned artists. 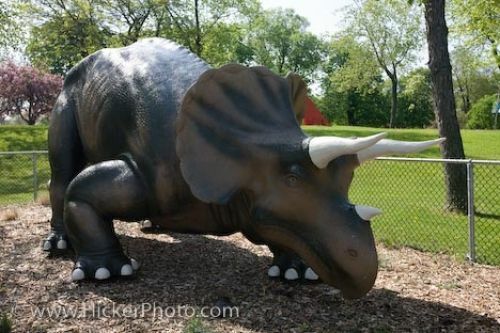 Picture of the Triceratops dinosaur sculpture in Odette Sculpture Park in the City of Windsor in Ontario, Canada. The sculpture park is open all year with free admission making this a unique experience for all who visit Windsor, Ontario. Dinosaur sculpture in the Odette Sculpture Park (Assumption Park), Windsor, Ontario, Canada.